Item Number: 810-S1900VE410 18371 Actual Weight: 23 lbs. Provides large capacity storage space for valve and electrical lockout hasps and padlocks. Upper and lower sections are lockable for added security. 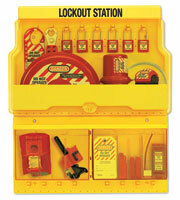 Use the upper deck for larger lockout devices and padlocks and the lower area for tags and smaller lockout devices. Upper deck has 16 hanger clips that hold 2 padlocks or lockout hasps each. Lower area has two drawers that tip-out for storage convenience and protect contents from dirt and grime. Hang peg hook hangers (not included) from holes along bottom for storage of large or bulky devices. Filled electrical, filled valve, or unfilled lockout station available.